Lucas Paqueta opened his Brazil account but it was not enough to prevent the Selecao from slumping to an alarming 1-1 draw with Panama in the absence of the injured Neymar. Brazil were on top for much of the game and created the better chances, but without Neymar they lacked a leader in attack and failed to beat a Panama side who have lost to the likes of Ecuador and Honduras since exiting the 2018 World Cup pointless. Wearing Brazil's number 10 jersey – usually reserved for Neymar – for the first time, Paqueta scored just past the half-hour mark, though Panama equalised in contentious fashion through captain Adolfo Machado, who appeared to be offside. An entertaining second half saw both sides hit the crossbar, with Brazil doing so twice, but neither side found a winner as the team ranked 76 in the world held on for a memorable result in Porto. 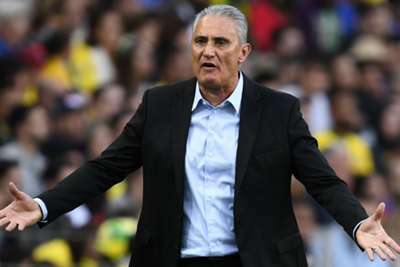 Unsurprisingly, Brazil – who by contrast sit third in the FIFA rankings – took control early on and crafted a good number of chances, first going close in the 18th minute when Roberto Firmino headed Alex Telles' cross just wide. Arthur was the next to threaten, twice shooting agonisingly wide of the left-hand post with long-range efforts about a minute apart. Paqueta found the mark, however, latching on to Casemiro's brilliant cross from deep and guiding a volley in off the hand of goalkeeper Luis Mejia. But Panama hit back, Machado – who was slightly offside – controversially heading Eric Davis' free-kick delivery beyond the stranded Ederson. Richarlison almost restored Brazil's lead just after the break, only for his excellent volley from Fagner's cross to hit the bar. Panama followed suit in the 62nd minute, as Harold Cummings' header came back off the frame of the goal. Casemiro was the next to be denied by the woodwork 19 minutes from time, and Richarlison put the awkward rebound over, consigning Brazil to a woeful result, which could have been even worse had substitute Jose Fajardo's last-gasp volley not only hit the side-netting. There should be more to this team than Neymar, given how much talent is at Tite's disposal, but against Panama they appeared to really miss their talisman. That should not be the case, as Julio Dely Valdes' team lost 10 of their previous 11 matches before facing Brazil, and Neymar – who was in the stands – would not have been impressed by what he saw. Wearing Neymar's jersey, Paqueta looked lively in attack and certainly showed his potential, while his movement for the opening goal was excellent, even if he did get a little lucky with the goalkeeping. Aside from an early header and a clever touch to set Paqueta up for a chance which he hit straight at the goalkeeper, Firmino was quiet before his second-half substitution. Richarlison offered significantly more energy and purpose in attack, though he lacked end product, while Philippe Coutinho did not live up to his senior status in Neymar's absence until improving late in the game. Brazil travel to Prague to face the Czech Republic in another friendly on Tuesday, while Panama have no other matches scheduled in this international period.